Photo: Wayne Kurtzman, Globalfinals.org – click for full size image. 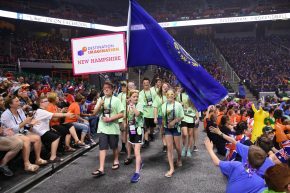 36 New Hampshire Destination Imagination teams were among the 1,426 teams that competed in Destination Imagination Global Finals in Knoxville, TN last week. Teams competed in STEAM based Challenges focused on creativity, collaboration and problem-solving skills – some of the most in demand skills in the new economy. Global Finals provided unique educational opportunities, including the ability to meet people from around the world – 19 countries in all. Main Dunstable Elementary School, Nashua – 7th place in the scientific challenge. Teams formed in schools and community groups in the fall, and teams advanced through regional and statewide competition. Teams built the high-demand soft skills of communication, collaboration, creativity and problem-solving, some of the most in-demand skills for the future of work.